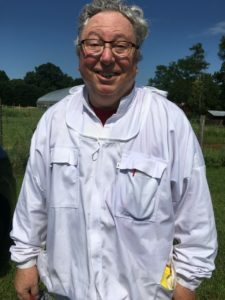 Bobby Byrd is a new beekeeper this year and he just received his NCSBA Master Beekeeper Program Certification. So, congratulations Bobby! Bobby has been working with me quite a bit in the bee yard this spring and today we did sugar shakes on 2 of the 6 hives to check on mite load in the hives. Last week we did 2 and in a week I’ll do the last 2. Today’s hives are the Buckfast/Carniolan Mountain Bees and Purdue Anklebiter Bees. When wethat we did a mite check on June 24th, the Mountain bees had 0/300 mites show up and the Anklebiters had 2/300. This is the time of year when we see the mites ramping up, so we’re watching all of the hives because we want the bees to go into winter in as good of shape as possible. The mite checks this time came out to 6/500 bees for the Mountain bees and 2/300 for the Anklebiters. That’s still under the threshold of 3/100 where we treat. So these bees are doing a good job of managing the varroa on their own. To do the sugar shake, we first find a frame of open brood with a lot of bees on it. We make sure the queen is not on the frame (we found her on a different frame before we did the shake). I pick open brood because varroa will be riding around on the nurse bees getting ready to hop in the cells about 24 hours or so before the larva is capped. Next, we shake the frame into a clean dish pan with rounded edges (this works better for scooping). A strong shake does the job. Forager bees with pollen on their legs will hopefully fly away once they are shaken into the pan. The bees left are mostly the nurse bees. A little thumb on the pan moves them all down into one corner, and we scoop 1/2 cup of bees (about 100 ml or 300 bees) into a measuring cup (also rounded) and dump them into a jar that has a screened top. Once the lid is on the jar, we add about 1 1/2 tablespoon of powdered sugar to the bees, through the top so all of the lumps of sugar are broken up. A little roll will cover the bees with sugar and then we put them in the shade for a couple of minutes. After 3 or 4 minutes, we shake the powdered sugar off the bees into a white bucket. I do a second coating of powdered sugar and wait a minute or two and then shake again. You can put some water in the bottom of the bucket before you shake or after you shake. The water will dissolve the powdered sugar so you can more easily see the varroa floating around in the water. Then we count the varroa. If you use 1/2 cup of bees, that’s about 300 bees so you can get the ration of mites/bees. 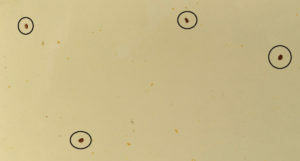 Treatment level in our area is 3/100 or a total of 9 varroa for 300 bees. That doesn’t sound like a lot of varroa per bees, but most of the varroa are still in the capped brood at this point, so it’s probably more like 10% varroa load. Here’s a video of Bobby doing the sugar shake on the Mountain Bee hive. There were more like 500 bees in the jar for this shake.